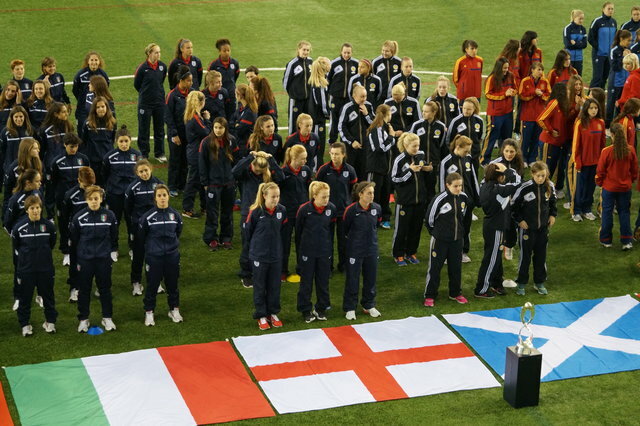 We set out to find a ContiReporter to travel to the UEFA U17 Women’s Finals, and we found the amazing Ailsa. 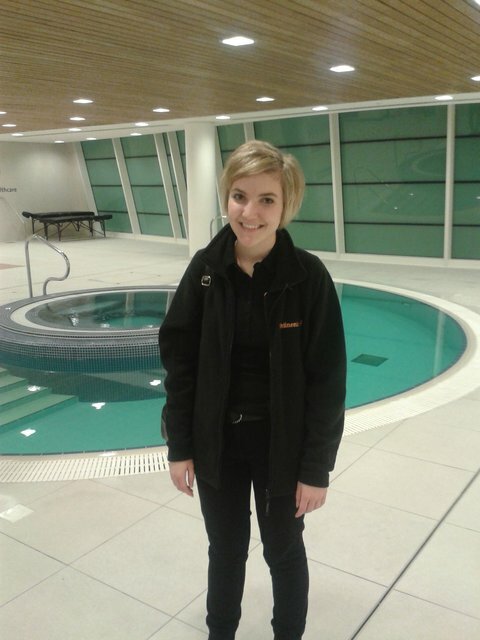 Last week she spent three days at the FA English National Football Centre, St George’s Park to find out more about the competition, to meet some of the footballers and to watch the opening game. When Mum first told me I’d won the Conti-Reporter competition I’d entered with Jump Magazine I didn’t believe her at first. I was over the moon and couldn’t wait to find out what amazing things I’d be reporting on while I was at the Under 17 UEFA Championship! Me and my Dad travelled down to Burton-upon-Trent on the Sunday night because it was a long drive from West Cumbria. When I first went past the sign at the front of St. Georges Park, the Football Association’s National football centre, butterflies and pure excitement rushed over me. I still couldn’t believe I was getting such a great, once in a lifetime opportunity. We had to wait in the Hilton Hotel reception where we would be staying for David Hedges – my own cameraman and Simon Russell from Inside Media who’d be taking care of me and Dad throughout the three days. It all seemed slightly surreal sitting in the hotel’s reception that was plastered with posters for the Under 17 UEFA Championship, watching the different teams go by. Me and Dad did get rather excited when former England Ladies Manager Hope Powell just walked past! After we’d met David and Simon, who were really enthusiastic and friendly, our first item on the schedule was an official press conference with England Under 17 coach, Lois Fidler, and the head coaches of the other teams in England’s group: Portugal, Italy and Austria. I got the chance to ask Lois a question in the press conference which was rather nervewracking but it went well. It had helped that before the press conference started, Lois came up to me and introduced herself, she even shook my hand which was unreal. David was videoing the conference and I had a proper wireless radio microphone on the whole time so my voice could be heard on the video. After that, it was clearly dinner time as we were all hungry. We got to have our dinner in the modern bar, that was covered in photos of past and present footballing stars. When we had eaten we went down to the Football Centre to do some filming. David filmed me saying how I’d felt the press conference went and I explained to camera what we would be doing next. The next event on the agenda was the tournaments opening ceremony. All the teams taking part in the tournament were going to the indoor pitch to have a massive photo taken. Each team lined up in front of their countries flag while all of the photographs were taken by the press (me included) on the balcony. 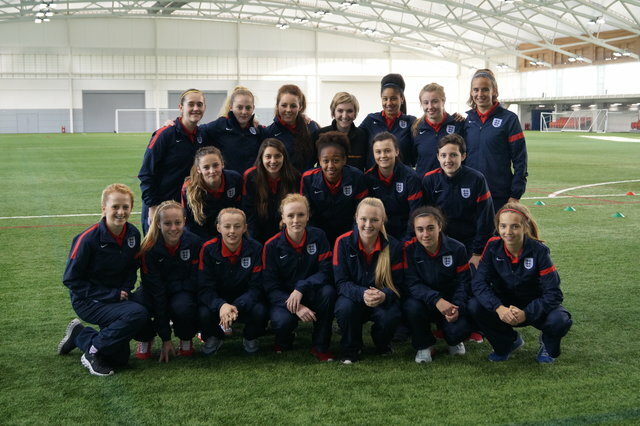 When all the photos had been taken Lois Fidler waved me down to come and meet the England Under 17s! Captain Leah Williamson introduced me to all the team and I got my photograph taken with them. I also got the chance to ask them all a few questions about how they felt about their upcoming match and their country hosting the tournament. They were all lovely and really friendly. It was interesting finding out where all the girls were from. They had travelled from all over the country, from North Yorkshire to Milton Keynes. They all started asking me questions wanting to know if I played football myself and what position. Goalkeeper Kirstie Levell gave me a high five when she found out I was a goalkeeper and she was pleased to learn that I support Everton, the team she plays for! If that hadn’t been exciting enough it was now time for the guided tour of St. George’s Park Football Centre. It was obvious no expense had been spared when the centre had been built. The tour took us round the elite changing rooms that the England Under 17s were currently using, the indoor pitch which was absolutely huge and incredibly impressive, the massive gym bursting with equipment and the hydrotherapy suite. We saw the ice bath that the players use after training and matches, the underwater treadmill, only one of four in Europe and even an altitude room. During our tour David got me to do a few little pieces to camera about what I thought of the facilities and how I felt being there. That was the end of my official duties for Monday. Me and Dad had a lovely tea in the exclusive UEFA restaurant then we collapsed into our beds after a hard, enjoyable day of reporting. Well done you! Great article BTW!